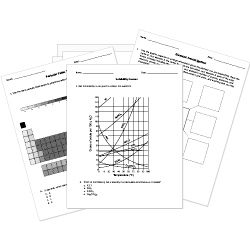 You can create printable tests and worksheets from these Grade 8 Bonds and Mixing questions! Select one or more questions using the checkboxes above each question. Then click the add selected questions to a test button before moving to another page. What are the two major categories of matter? [math]MgF_2[/math] is an example of a(n) . A mixture of two or more uniformly dispersed substances is a . An ionic bond is the attraction between . Solubility is dependent on two things. Which of the following is not one of the two? Solutions, suspensions, and colloids are all types of mixtures. A bond is known as if the atoms equally share one or more pairs of electrons. Carbon is able to bond with atoms of other elements in many different ways because it has . Ionic bonds involve the sharing of electrons. Select the answer below that is true about mixtures and compounds. Mixtures are formed when substances physically combine while compounds are formed when they are chemically combined. In mixtures the substances keep their properties, but in compounds the substances combined can lose their properties and become a new substance. Compounds require a chemical reaction to separate their parts, but a mixture can be physically separated. Electrons involved in bonding between atoms are .